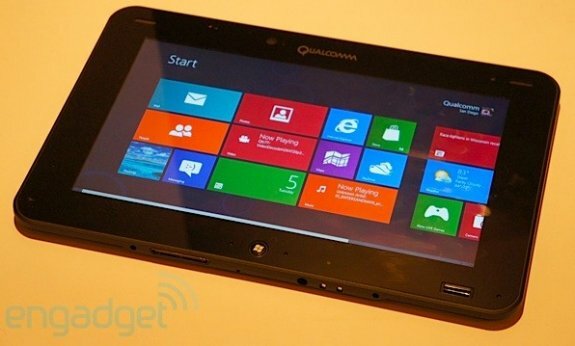 Both The Verge and Engadget placed their paws on the Liquid Development Tablet and took the dual-core 1.5 GHz APQ8060A Snapdragon 4 processor and Release Preview build of Windows 8 RT through the paces. Qualcomm was adamant that the system hadn't been fully optimized yet, and that statement rang true given the difficulty we had doing some bezel gestures, not to mention some memory management (open apps kept vanishing) and rendering issues here and there, but it's plenty neat to see this stuff running even at this early stage. The verdict? It's smooth as silk on a 1.5GHz dual-core APQ8060A with 2GB of RAM, which means it's likely to be even more impressive on the company's quad-core offering... Most interesting, however, was a demo of Vendetta Online which ran without hiccups even when multitasking along with other apps.